Human sensitivity to radiation is largely dependent on age. This graph shows the variation of the effective dose doses released by the ingestion of a million becquerels for a few well known radioactive elements. While all living cells have a certain regenerative power, those of babies and young children, which are regenerated much more quickly, are much more sensitive to radiations than those of adult . The comparative toxicities (known as dose factors) vary also enormously from one element to another. Most damaging of all are the alpha-emitters, represented here by plutonium. 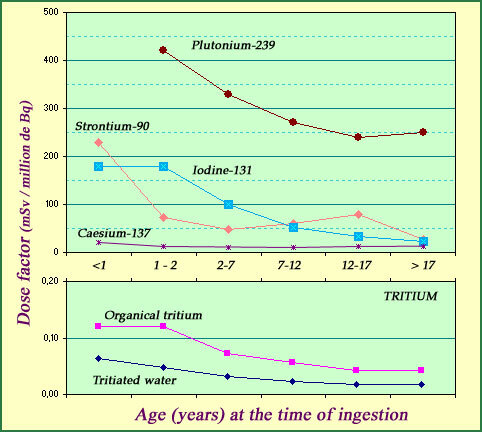 The radioactive toxicity of tritium is comparatively so low that it had to be drawn on a separate scale.